New Mexico Family is Named America's Most Playful Family! | KaBOOM! New Mexico Family is Named America's Most Playful Family! Spy games? Zombie tag? All in a day of play for America's Most Playful Family. 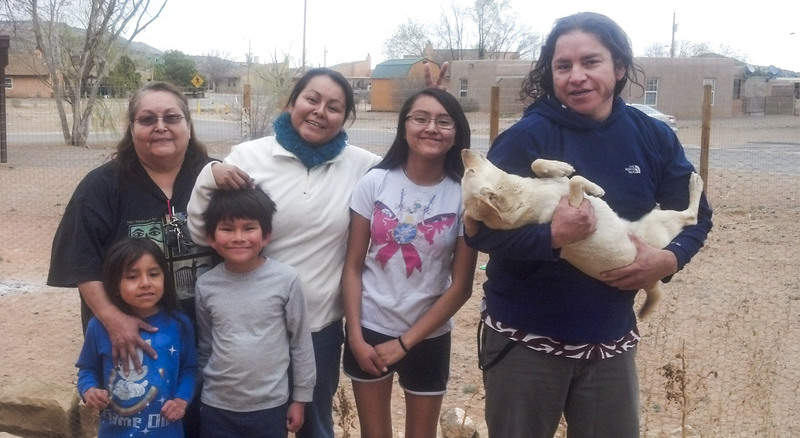 KaBOOM!, the national non-profit dedicated to giving all kids a childhood filled with play, named the Thomas family from Laguna, Pueblo, N.M., winners of the America's Most Playful Family contest! The contest, made possible by the generous support of Walt Disney Parks and Resorts, launched in January during Disney's two-day "Discover Together" symposium focused on how adults can make a difference in children's lives by spending meaningful time with them. The Thomas family spans three generations, and uses play as a way to teach valuable life lessons on health, partnership, relationship-building, culture and tradition. Access to conventional play infrastructure is limited in their community, so they challenge themselves to use nature and their surroundings as resources to incorporate balanced and active play and laughter into their daily routines. The family regularly hikes and bikes together, and their backyard is often used for creative play, including traditional games, new spins on centuries-old favorites and games the Thomas family develops together. "The Thomas family is a shining example of how families can stay active, create rich experiences and have fun together – through play," said James Siegal, executive vice president and chief operating officer of KaBOOM!. "By instilling the fundamentals of a balanced, active life at home in a playful way, they, along with all of our entrants, exhibited the importance of incorporating play in our everyday lives, and the role that caring adults have in helping foster a playful environment." Through the contest, which was made possible by support from Walt Disney Parks and Resorts, the Thomas family demonstrated that play matters – not just as an activity for their kids, but as an activity their whole family can enjoy together. In addition to the esteemed title, they are receiving a trip to their choice of Walt Disney World® Resort in Orlando, Fla. or Disneyland® Resort in Anaheim, Calif.
"Sharing time together is such an important way for families to bond and grow," said Jacob DiPietre, vice president, corporate citizenship, Walt Disney Parks and Resorts. "Our Cast Members and Imagineers strive to create special places and great experiences within our theme parks and resorts where kids and adults can spend meaningful time together. Now, through our work with KaBOOM!, we are continuing to nurture, empower and inspire kids and families everywhere through play." A panel of celebrity judges helped KaBOOM! determine the winning playful family. Star of ABC's hit sitcom "Modern Family," Rico Rodriguez and his sister, actress Raini Rodriguez from Disney Channel's popular "Austin & Ally," along with Olympic Gold Medalist Joss Christensen, ESPN SportsCenter anchor Jay Harris, and other personalities all helped select the Thomas family as America's Most Playful Family. Check out all of the playful family contest participants and share additional stories about play by following KaBOOM! on Facebook and Twitter, or searching #playfulfamily. Walt Disney Parks and Resorts are where dreams come true. More than 55 years ago, Walt Disney created a new kind of entertainment families could experience together, immersed in detailed atmospheres and vibrant storytelling. His vision now includes a collection of five of the world's leading family vacation destinations – Disneyland Resort, Anaheim, Calif.; Walt Disney World Resort, Lake Buena Vista, Fla.; Tokyo Disney Resort, Urayasu, Chiba, Japan; Disneyland Paris, Marne-la-Vallée, France; and Hong Kong Disneyland Resort, located on Lantau Island. A sixth resort, Shanghai Disney Resort, is currently under construction in Pudong New District, Shanghai. In addition, Walt Disney Parks and Resorts includes the world-class Disney Cruise Line; Disney Vacation Club; Adventures by Disney, a guided group vacation experience to some of the world's most popular destinations; and Walt Disney Imagineering, which creates and designs all Disney parks, resorts and attractions.